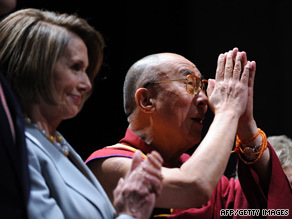 Pelosi calls Dalai Lama "one of the most highly honored peacemakers of our time"
WASHINGTON (CNN) -- The Dalai Lama, accepting a human rights prize from a U.S. foundation Tuesday, chastised the United States for not fully addressing the economic divide between its poorest and richest citizens. The Dalai Lama sits with House Speaker Nancy Pelosi at the awards ceremony on Tuesday. "Huge gap, rich to poor. This is unhealthy," he said. "You have to think seriously about those less-privileged people. They're also human beings." The "real greatness of America," he said, "is your ancestors' principles," and he urged the nation to preserve those principles. "When I think of America, I think of the idea -- concept of freedom, liberty, equality. I think these are real human values," he said. The inaugural Lantos Human Rights Prize, presented to the 74-year-old Dalai Lama by House Speaker Nancy Pelosi, honors his commitment to ending global injustice. The Dalai Lama called the award, from the New Hampshire-based Lantos Foundation for Human Rights and Justice, "a great privilege, especially because it is named after an individual I admired deeply." He was referring to the late Rep. Tom Lantos, D-California, whom the foundation describes as a champion of human rights during his 27 years in Congress. Lantos, who was the only Holocaust survivor in Congress, died of cancer in February 2008. His image is on the large medal. Before presenting the award, Pelosi said people continue to be inspired by the Dalai Lama's messages of peace and nonviolence. The medal, the California Democrat said, contains the words "The rights of one are the rights of all." "The Dalai Lama is one of the most highly honored peacemakers of our time," she added. Tuesday's program focused largely on the work of Lantos, who co-founded the Congressional Human Rights Caucus about 20 years ago. The name of the caucus has been changed to the Tom Lantos Human Rights Commission, and part of its mission is to "promote, defend and advocate internationally recognized human rights norms in a nonpartisan manner," according to its Web site. The group is a formal entity of Congress, said Howard Berman, D-California, who was at Tuesday's event. Also at the ceremony was Sen. John McCain, R-Arizona, who called Lantos "an inspiration." "When he died we lost one of the better angels of our national conscience," McCain said. According to the foundation, created by Lantos' daughter, Katrina Lantos Swett, the Lantos Prize is meant to focus attention on the "often unsung heroes of the human rights movement." The foundation's Web site says the prize "will be awarded on an annual basis to the individual or organization that best exemplifies the foundation's mission, namely, to be a vital voice standing up for the values of decency, dignity, freedom and justice in every corner of the world." The Dalai Lama is visiting Washington this week for a conference and to meet with Undersecretary for Global Affairs Maria Otero, who has just been named as President Obama's special coordinator on Tibet, State Department spokesman Ian Kelly said Monday. The Dalai Lama won't meet with Obama, who instead plans to visit with him after a presidential trip next month to China, Kelly said. The Dalai Lama and Tibet are dicey issues in Washington, since Beijing considers the Himalayan province a part of China and accuses the spiritual leader of advocating Tibetan independence. The Dalai Lama -- whose name is Tenzin Gyatso -- has repeatedly said he seeks autonomy for the region, not independence, and advocates the "middle way" of nonviolence. China has ruled Tibet since 1951, a year after sending troops to "liberate" the region from what it said was serfdom under the Dalai Lama. The Dalai Lama's emissaries have held sporadic talks with Chinese officials. But the talks, encouraged by the United States and other countries, have failed to break the impasse. In a 2007 trip to Washington, the Dalai Lama met with then-President George W. Bush, who awarded him the Congressional Gold Medal, the nation's highest civilian honor. Asked whether the lack of a meeting between the Dalai Lama and Obama represents a change in U.S. policy toward China or Tibet, Kelly said, "I wouldn't necessarily read ... anything into the decision beyond what it is." "Our position regarding China is clear, that we want to engage China. We think China is an important global player. We also don't try and downplay some of the concerns that we have about China ... in the areas of human rights, religious freedom, and freedom of expression." The Dalai Lama won a Nobel Prize for advocating peace, but he has not been allowed to return to Tibet since fleeing his homeland in 1959. On Thursday and Friday, he is scheduled to participate in a conference called "Educating World Citizens for the 21st Century." On Saturday he is to spend the morning teaching on "The Heart of Change: Finding Wisdom in the Modern World," an event organized by the Conservancy for Tibetan Art and Culture. He then is slated to return to India before traveling to Japan, Australia and New Zealand.